One year ago, one of the Ravenna Blog interns (whose birthday happens to be New Year’s Day) really really really wanted to do the Polar Bear Plunge at Matthews Beach please mom please. So we went. 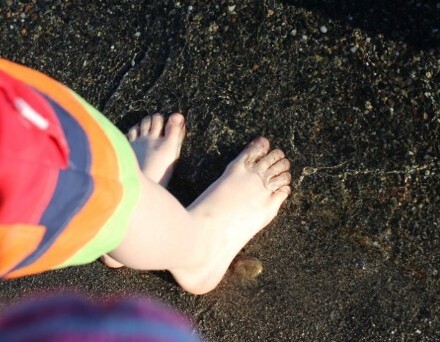 He got his five-year-old toes wet, and I was proud of him. 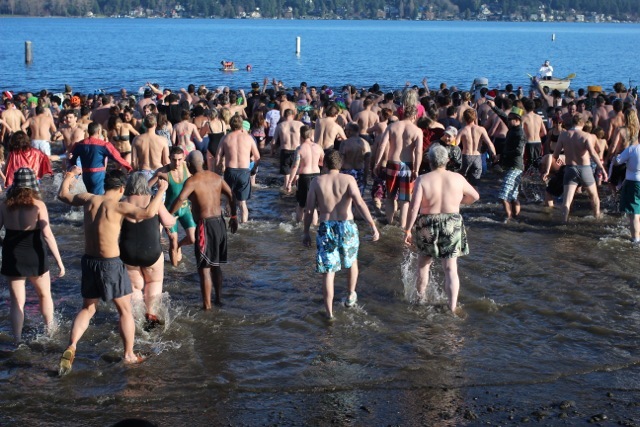 The 2014 Polar Bear Plunge is coming up on Wednesday, January 1, at Matthews Beach (9300 51st Ave NE). 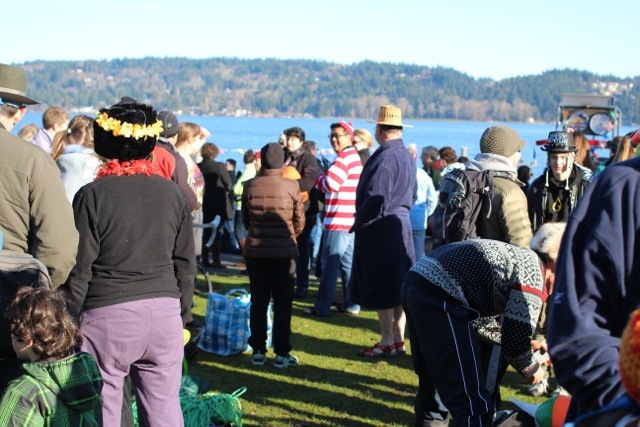 People dressed in swimsuits and wooden Viking helmets and costumes will run into the cold, cold waters of winter Lake Washington to celebrate the coming of a new year…and win a Patch of Courage for submersing themselves up to their necks. Participants may start registering on-site at 11 AM, with plunging to take place at noon. More information follows, as well as pictures from the 2013 Polar Bear Plunge. It’s cold out, but it’s a festive atmosphere. 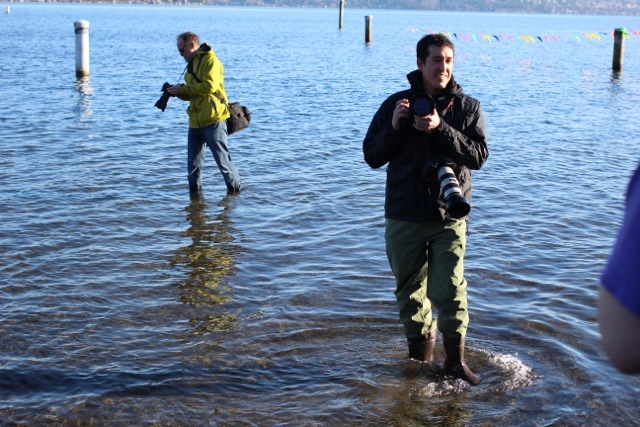 The Polar Bear Plunge was the first official event of its kind in the Seattle area. Janet Wilson, Aquatic Center Coordinator at Meadowbrook Pool, started the event off on January 1, 2003. 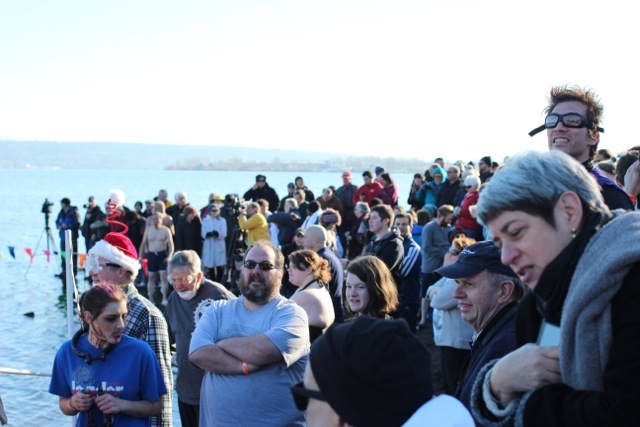 About 300 people participated in the first Polar Bear Plunge; since then the attendance has reached nearly 1,000 brave bears. 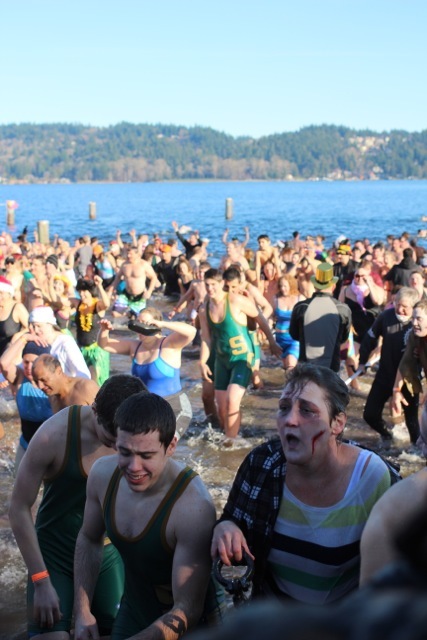 The plunge has inspired other, similar events in the Seattle Area. At this family event, wear a costume, enjoy warm beverages, and receive a Patch of Courage if you immerse yourself. Not even Waldo himself could stay in hiding from this event. Why, YES, even children can participate. Kids (as well as folks who might need to take things a little more slowly and/or carefully) enter the water before the rest of the huddled, shivering masses. Above is as far as the birthday boy got, which I still found impressive. …to the other (north view). Lifeguards are on duty. The event is rather popular for local photographers/media folks, too. (Though they tend to be dressed to stay dry.) In the foreground here is Josh Trujillo (Seattle P-I). And at noon, everyone not simply spectating heads into the lake! 1. Come early/Carpool/Take the bus: Parking is limited! Plan your trip with the Metro Trip Planner. 2. If you have heart problems, consult your health care provider BEFORE taking the plunge. 3. Don’t drink! Alcohol does NOT warm you up, and actually accelerates hypothermia. 4. Do not stay in the water longer than 15 minutes. Body heat is lost 25 times faster in water than in air. 5. Do NOT remove your warm clothing until swim time, and DO remove wet clothing before getting back into dry clothes. I’m not sure if the woman on the left was a zombie BEFORE she went in, or just after. 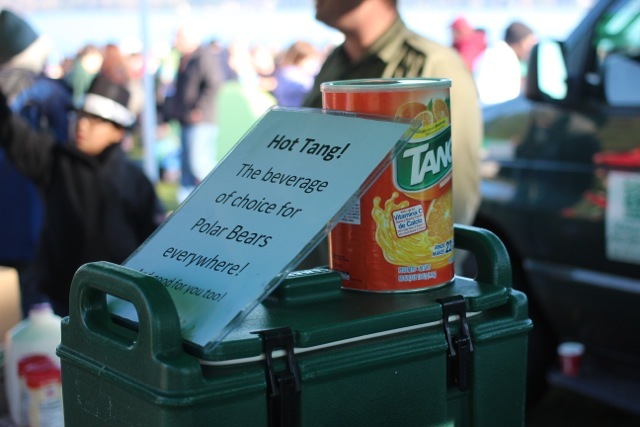 After the plunge, participants are treated to the Official Polar Bear Plunge Beverage: HOT TANG. Sounds gross, but is actually quite tasty. 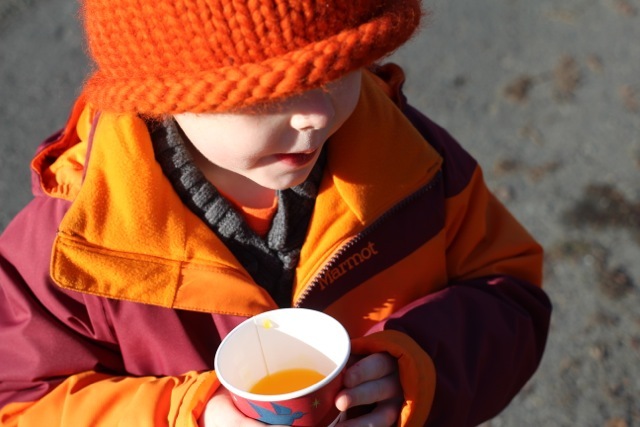 Think Hot Apple Cider, but with faux orange flavor instead. 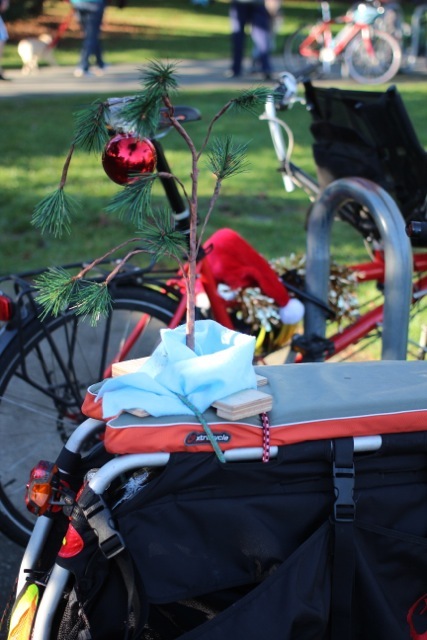 The Burke-Gilman Trail cuts through Matthews Beach Park, and is another excellent way to get to the park without a car. 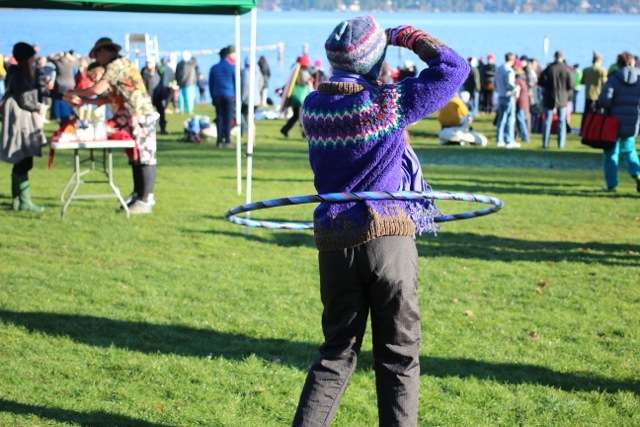 Great way to get warm after the plunge, too, by cycling or hoofing it home on the trail. Ravenna Blog Intern #1 enjoying his HOT TANG. The Polar Bear Plunge has a Facebook page if you’d like to learn more about the event, or see more of last year’s crazy people participants. The number of people willing to jump into 46°F water in January while barely clothed is impressive. 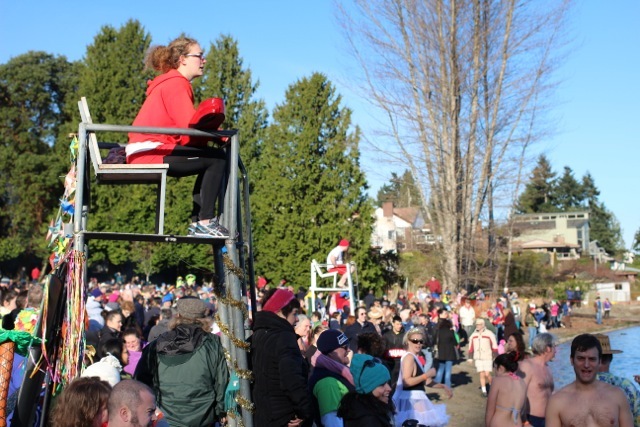 For those who might appreciate more of a warm-up before plunging into winter lake water, there is a Resolution Run 5K and Polar Bear Dive down at Magnuson Park, also on January 1. Registration is limited to 2,500 crazy people.